Buy online or in our store, it doesn't matter. If you live within our eight county delivery zone, the Don's Furniture and Mattress team of professionals will gladly deliver and setup your new furniture or mattress with delivery rates as low as $39! Our delivery service is a “white glove” two person service that includes: inside placement to room of choice, stair carries (up to 2 flights), unpacking, set-up of basic frame (tool less), set-up of the adjustable base (if included in your order), and removal of packaging debris. Standard delivery service is Monday – Saturday 9:00 AM – 6 PM (based on scheduling and delivery zone). NO delivery on Sunday, New Year’s Day, Good Friday, Memorial Day, Independence Day, Labor Day, Thanksgiving Day, and Christmas Day. A pre-call contact will be attempted within 48 hours after the confirmation of an order. The delivery agent will call when the product is received to schedule delivery. We will attempt to deliver within a (3) three hour window and within (10) ten business days of receipt of the product from the manufacturer. 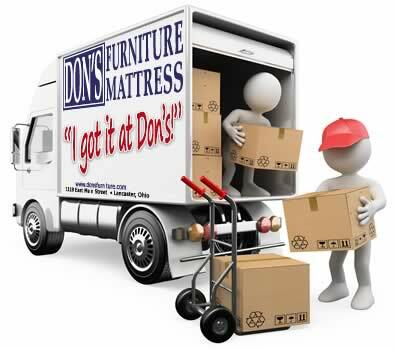 Don's Furniture and Mattress makes every effort to deliver your purchase to you within a (7- 10) seven to ten business day time frame. Delivery rates start as low as $39. Rates will vary depending on your delivery address. In order to maintain the level of service our customers expect, Don's Furniture & Mattress provides delivery only to the Ohio Counties of Fairfield, Franklin, Delaware, Licking, Pickaway, Perry, Hocking, and Ross. If you live outside our standard delivery zone, you are welcome to pick up your purchase at our store or call (740) 653-2118 for special pricing on deliveries outside our normal delivery zone. Depending on the size or your purchase, many items are big and awkward. If you choose this option, make sure you have the proper vehicle and tie downs to safely transport your new purchase. We will do all we can to help you secure the product to your vehicle. Just keep in mind that we are not responsible once you leave our store. Please feel free to give us a call if you have any questions regarding pick up sizes, weights, and recommended vehicle size. If you purchase your furniture or mattress through our online store you can expect delivery between 10 and 14 business days from the date of your order confirmation. This estimate is based on our experience and it could be more or less. You will receive a call from our delivery department to make delivery arrangements within 48 hours of your order confirmation. If you have any further question on your order status, you can call us at (740) 653-2118.